The report that it’s based on doesn’t however say that. The graph that the DWP has chosen to use, Figure 7 in that report, does not show that people have “moved into work”. It shows, rather, the possibility that people will have done any work at all at any period while on benefit. 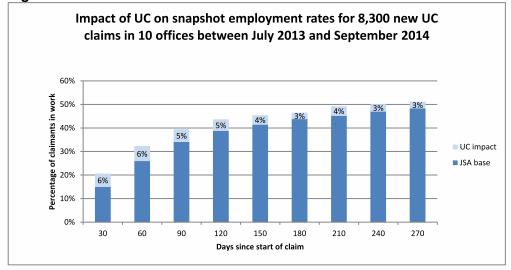 The original title of Figure 7 is: “Impact of UC on cumulative employment rates for 8,300 new UC claims in 10 offices between July 2013 and September 2014”. The figures for occasional hours are, unsurprisingly, more favourable for Universal Credit than for JSA, because the system allows for that. 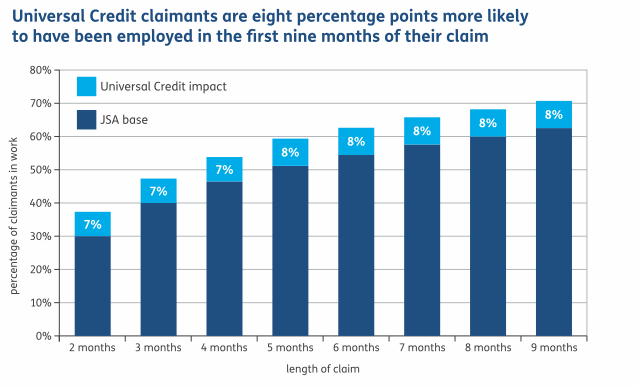 The title of that figure – part of the information dropped from Universal Credit at Work – explains that this was done early on in the system (when UC was not being rolled out to areas of high pressure).